My games are genuine, install in one step, look, sound and play in Macintosh OSX like they did in the old days, or your money back. This is my unconditional guarantee for three years. This listing includes the original game CD. Online help is available within the games. The box is pictured for reference and is not included. I will also provide a compatibility CD that will allow the game to run under OSX versions 10.6 and higher. This covers any Macintosh made since late 2009. Verify your version: From the Apple menu (upper left of screen) select About This Mac. Want to play? Click the icon. Want the game off your computer? Move the game to the trash. Zero hassle. 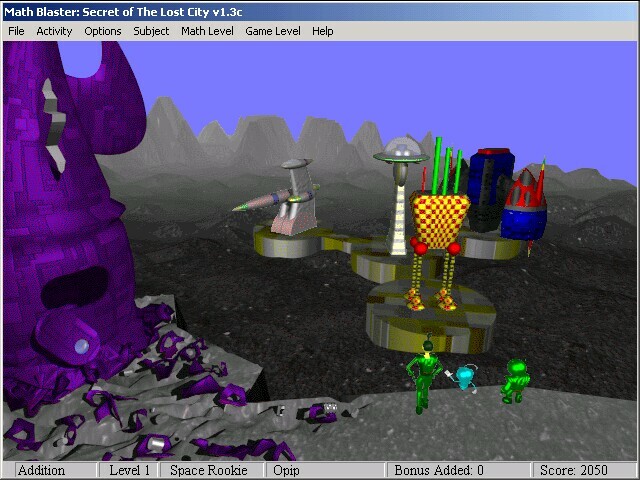 Blasternaut, Galactic Commander, and Spot, are out searching space for The Lost City in their violet magenta cruiser. Galactic Commander feels this mission so important that she has left her normal duties at the base and joined the crew. Blasternaut and spot, however, are less than thrilled with the seemingly fruitless search. 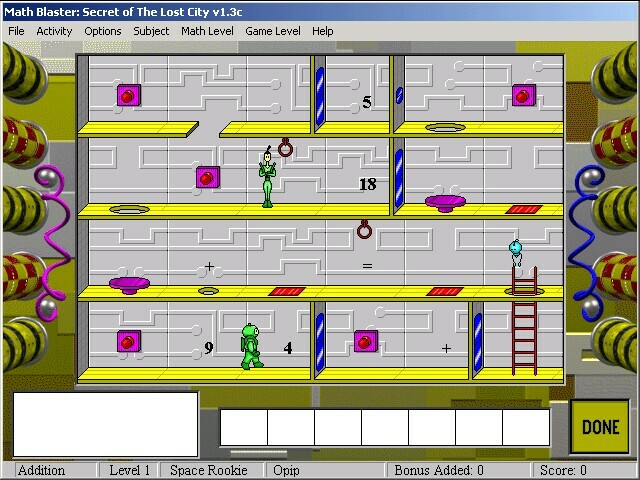 Maze Craze: Here the player will control the Math Blaster crew to collect all the numbers and operations to make a complete equation and clear the area. The player has to switch between the characters to open certain doors, or perform certain actions; for example, only Galactic Commander is tall and strong enough to pull ceiling chains. Creature Creator: The player will start with one creature composed of a number of interchangeable parts in a bow arrows will then lead to a contiguous box the number of arrows indicates how many parts need to change. The player will then need to make more changes for the next box until there are no more, this will be the final mutation. Position Splash: Negatrons, formless yellow critters, carrying numbers will enter from the top of the screen an equation with a missing number will be at the bottom. However not all the negatrons are carrying the right number. So those without the correct number must be eliminated. The player controls one of the three crew members and can run left and right while throwing some sort of water grenade. Negatrons that have been hit will wander the stage and throw poisoned blobs at the active crew member, should he be hit another will take his place. This area ends when five problems have been completed, or answered incorrectly, or if all three crew members are hit. Number Hunt: Here the player needs to find equations that equal a number between a range given at the top of the screen. Naturally these equations are on giant slabs all over the screen. A crew member will have to jump to and select the correct ones. Player beware! Many of the blocks can move back into the wall from which they jut sending the crew member out of commission. This area is over when five correct answers or five incorrect answers are selected, or all the crew members drop. Upon completion players will be treated to a detailed view of the true powers of the city.